Eastern Europe: The self-government of nationalists? In the last weeks, in Poland, Croatia and Ukraine, nationalist movements have seized political events and commemorations to revive the flame of passions with a disastrous past. In Poland, November 11th 1918 celebrates both the end of the war and the day of independence, after more than a century of Russian rule under the czars. Nationalist groups and violent football supporters have used this day to march in Warsaw for several years. The clashes with the opponents of the radical far-right, and with the police forces, reached this year an unprecedented level. The nationalist demonstrators tried to assault a squat occupied by young far-left activists, and then the Russian embassy. In both cases, they attempted to set the buildings on fire but failed. The nationalist mob then spotted a rainbow coloured monument symbolising peace, and destroyed it. In Croatia, in early September, in Vukovar (and several other towns), groups of nationalists, in front of cameras, smashed plates recently placed on the front of official buildings, which read the same information in both Latin and Cyrillic alphabets. The Serbian minority in the region had recently obtained this token of bilingualism after years of discrimination after the city was taken back in 1995. Nationalist Serbs had taken it over and emptied it of its Croatian population in 1991 after the collapse of Yugoslavia. Amongst the nationalist Croats, a lot bear the flag of the Independent State of Croatia (1941-1945) of Ante Pavelic, allied of Nazi Germany which assassinated hundreds of thousands of opponents, Serbs and Jews. In Ukraine, the opposition to the Regions’ Party lead government is demonstrating with determination against the choice of a move towards Russia, and of postponing a customs agreement with the European Union. Massive demonstrations are taking place in the capital Kiev, which gather several political tendencies. Amongst the flags, very visible till December 5th, are those of the Ukrainian Insurgent Army (UPA), founded by nationalists under the Nazis’ occupation, which had a chaotic alliance relationship with them. The UPA, though it fought the Nazi German troops, also took part at times in military action with the same troops, against Soviet troops, and Russian, Polish and Jewish civilians. Even after 1945, this organisation carried on attacking Russian and Polish forces, provoking the pro-Soviet Polish State into ethnically cleansing parts of land to “cut it from its base” (Operation Vistula, 1947). Sadly, we could give many more examples of this kind, about recent events. In all countries of Europe, nationalist groups are feeling like they have the wind in their sails. This trend may vary depending on the situation, but the common feature of all these movements in Eastern Europe is their connection with organisations or States, sometimes defunct, which base was conceived as “national”, in the sense of “ethnical”. The reality of Eastern Europe is of a true mosaic of languages, cultures and traditions, and has been for a long time. Any idea of an “ethnic based nation-State” in such an environment shows the historical reality of such a claim: deportations, massacres, and discriminations which maintain old hatreds, until the power relations change, and bring new retaliations. And so on. If changing the frontiers drawn by victorious powers over Germany in 1945 isn’t really on the agenda, it must be noted, as it’s been the case for centuries, that the same continental powers keep on playing with these nationalisms as with pawns on a chessboard. The Ukrainian case is emblematic, and is definitely not over: a huge country, with a relatively good amount of natural resources, happens to be the crossing part of the EU and Russian influence spheres. 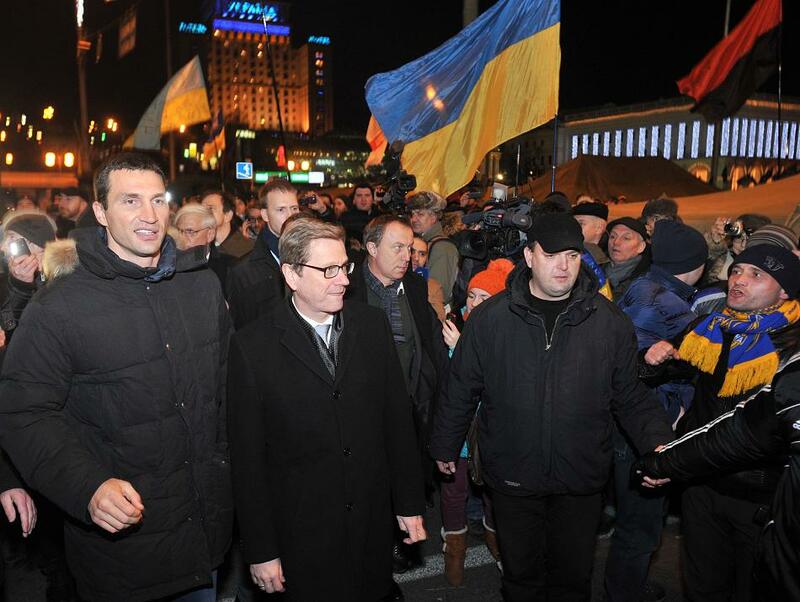 The co-presence of the German Foreign Minister Guido Westerwelle and UPA flags on the “Independence Square” on one hand, and the declarations of Vladimir Putin merging Russian and Ukrainian sovereignties together in the same sentences on the other hand, should alert us. The populations of Eastern Europe have nothing to gain from the return of nationalisms which ravaged this part of the World several times. Either, they don’t have much to expect from the powers which want to obtain their adhesion to fake alliances, to utterly unbalanced agreements, that would only benefit to the ones who already possess and control everything, on each side. Workers in Croatia and Poland can testify that belonging to the European Union has changed practically nothing to their material situation in the last years, but the fact that social inequalities have deepened. However, no “national” solution is worth considering, neither there nor here in France. The stakes of today clearly are international, nobody can make it “on his own”, we are all interdependent. Even better, those who take advantage of the differences in development between the different parts of the continent have a lot more to gain from the nationalist divisions which hide the particularly brutal class relationships within these societies, where underpaid workers make the fortunes of bureaucrats turned plain capitalists. The question is not about the “independence” of Ukraine, or of the other countries, but about how the economic agreements which will affect the real life of the populations of the continent are decided upon. As long as the masses will let themselves be taken in national and individual adventures, which actually only are games of alliances between the German (and Austrian) or Russian bourgeoisie on one side, and this or that fraction of the local nouveaux riches on the other side, their situation will only worsen. In the Eastern European countries like anywhere else, the masses must envisage their power as the base for new, democratic, cross-border and equal solutions. Neither the European Union of Angela Merkel and François Hollande, etc., nor the post-Stalinism of Vladimir Putin, nor “national” so-called “independent” entities, but a true solidarity-based federation, not just of Europe but of all mankind, this is the viable and desirable project. Today, working for this project means starting with denouncing in front of all the workers of Europe what is at stake in Ukraine and elsewhere, fighting against nationalisms and against the different ruling cliques which try to get a bigger slice of the cake, and building through the struggle, even the most apparently local, a true European and internationalist social movement. This article is the translation of Europe orientale : le droit des nationalistes à disposer des peuples ? Ce contenu a été publié dans English par Critique Sociale. Mettez-le en favori avec son permalien.